The Ashdown OriginAL C112-300 300W 1x12 bass combo delivers the origins of the company's tone in a lightweight, portable package. 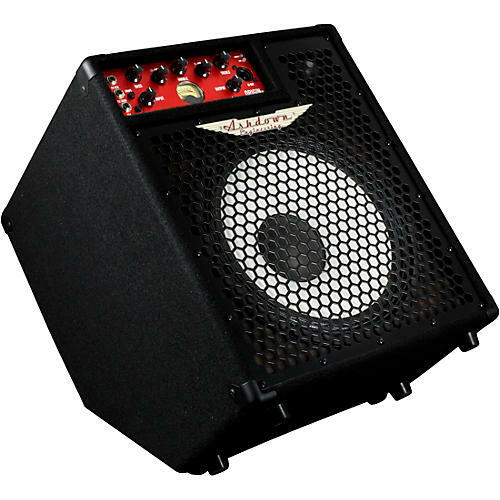 It's constructed with a useful kick-back design, which can be positioned on stage or in the studio to provide enhanced sound direction to the bass player and thus, better clarity. Also making the OrginAL combos stand out from the crowd is their offset head design, which allows room for the neighboring high-frequency tweeter –a clever use of space AND cool to look at. It may be a sign of the times, but one simply cannot ignore that compact and lightweight are two key amplifier requirements of the modern bass player. Weighting in at a tiny 27.5 lb. (12.5kg), Ashdown's OriginAL combos tick all of the boxes. The OriginAL combos are finished with high-quality and durable carpet covering which offers a traditional look and feel. Meanwhile, protecting the speakers is a heavy-duty steel hexagonal punched grille cover, designed to withstand the rigors of the road. To the right side of each combo is a single metal bar handle to allow for ease of transportation. Lastly, purposefully placed feet on two under-sides of the cabinet allows for two stage placement options. Each OriginAL combo is loaded with Ashdown Whiteline speakers, proven to deliver Ashdown's signature bass tone, with clarity and transparency that cuts through. The C112 has the flexibility of adding an additional 8-ohm Ashdown extension speaker cabinet to achieve maximum power. Starting from the top, a passive/active switch determines the whether the amp is being used with a high or low output instrument and sets a clear signal path to the input control. From here, the player can fine-tune their input level using Ashdown's trademark VU meter, which takes pride of place at the very centre of the amp head. With the signal at its optimal level, you then hit a defined set of features designed enhance your tone. The OriginAL features a tried and tested 5-band EQ, controlling your traditional bass, middle and treble with a lo-mid and hi-mid sitting comfortably either side of the variable middle control. The additional Shape control further sculpts your tone, lifting the frequencies that really count – like a smiley face on a graphic equalizer. The output control regulates the output volume of the amp and wrapping up the features on the front panel is an easy to reach DI output, as well as an independent FX send and return, which allows the amp to set a very clear signal path with no interruptions. Also, to the rear of amplifier is a headphone out to allow for silent practice. Ready for the RoadOffered with a 5 year warranty, OriginAL combos come complete with auto protect voltage for global touring musicians and an adaptive temperature controlled fan for road and studio use. Dimensions: 18.11" x 15.35" x 14.96"